​I specialize in wood from Alaska that I find myself. Many woods here are soft and will not take a polish or work out well on projects, so I stabilize it. While stabilizing I often add dye to enhance the natural pattern. I usually state what is all natural, stable and stable -dyed. I seek out interesting patterns in wood from drift wood piles, or fire burn areas, so work with naturally dead, usually from homestead land. Wood is brought in by boat or snow machine far from normal traveled roads. I am the source, and handle all the process so can offer good prices. I work with wood in my art, so can answer questions about my wood and it's various uses. 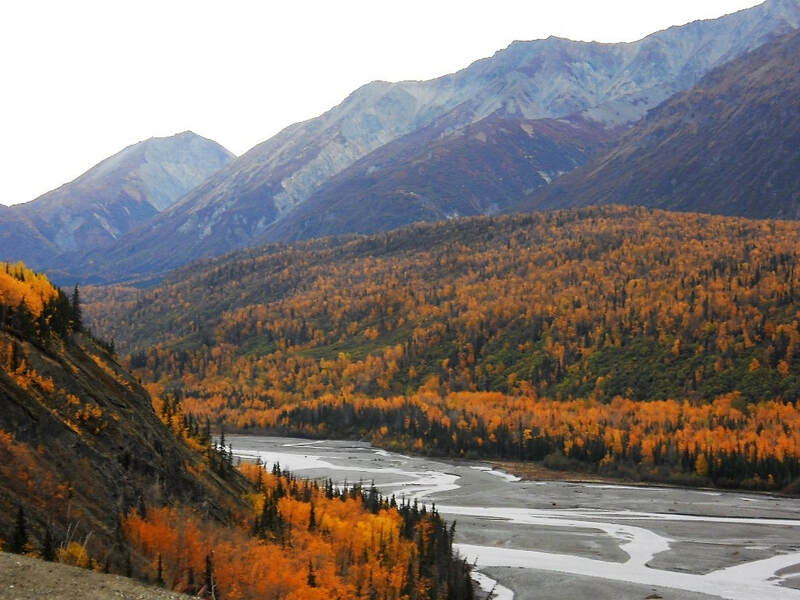 Alaska birch, cottonwood, alder, and willow are most commonly used in the order mentioned. These woods have little commercial market, so are not commonly found on the market. This makes the wood unique one of a kind. River birch block 4.5 x 2.5 x 1.5 inches. Stabilized birds eye pattern. Intended for the knife handle market but good for lath turning like pens, or carving projects. Can be cut any direction will not crack excellent patterns in this piece. Alaska river birch set 5 x 2 x 1/4 inch thick. Made to be knife scales but could have other art project uses Spautged birch dyed stabilized. If not treated this wood is to soft to take a polish or use for much. 'Rot' is what gives the patterns. Now stable hard will not crack. I use this material on my own knives. Alaska river birch natural untreated spaulted. 4.5 x 4 x 2 incvhes. Somewhat soft will not take polish but easy to carve (like balsa wood) and you could keep as is, or try stabilizing yourself (super glue for example) . Fairly light in weight. Price is good due to least work for me. Cotton wood burl block 10.4 ounces. 5.5 x 3x 1 inches. Stabilized lightly dyed. Nice sheen patterns change in the light. 7 x 2 x 2 inches. Nice sold heavy piece. Stabilized, slightly dyed. Nice knarly patterns and color variations. 5 x 2 x ½ inches. Cut to be knife scales. Stabilized and dyed , natural spaulted pattern in wood. Picture of back shows 'unfinished' but flat, it will look like the front side. 3.5 x 2 x 1.4 inches. Stablized. Good for carving project. Has some intereting bark in with the wood for pattern change- all hard and 'one piece. 4.5 x 3 .75 x 1 inch. Stabilized and dyed. Very good pattern of burl with birds eye and sheens. Almost a ‘gem,’ grade for pattern. Could be cut and turned on a lathe for pens, used for knives, pendants rings. Even scraps from this would have a value. 6 x 3 x 1.25 inches. Stabilized slight dye. Has interesting sheen all the way through to both sides. Great for knife handles (more than one set I think) or turn on a lathe, carved, etc. Slight damage on one end that is uneven and has some bark effecting half an inch that may work out in a project but may have to be avoided. Reduced price.